(3RD UPDATE 2:43 P.M. EDT U.S.A.) wserra, an attorney, Quatloos moderator and occasional poster on the PPBlog and RealScam.com, appears recently to have been targeted by a crackpot who desires to hector wserra with complaints to the bar association. Among other things, Quatloos publishes information on the bizarre undertakings of “sovereign citizens” in the United States and Canada. It is not uncommon for “sovereign citizens” and/or “supporters” of HYIP “programs” and/or bizarre MLM “programs” to hector sites such as Quatloos and RealScam and the PP Blog. Whoever advanced the hectoring campaign against wserra appears also to be interested in simultaneously hectoring RealScam and the PP Blog. The PP Blog occasionally posts on RealScam.com, typically providing context on scams-in-progress or comparisons with previous scams. Over the years, both RealScam.com and the PPBlog have been targeted with DDoS attacks and bizarre forms of menacing. In addition, the theory seems to hold that JSS/JBP was a legitimate “program” and that the PP Blog was engaged in espionage in violation of U.S. law. JSS/JBP may have links to the so-called “sovereign citizens” movement. The Blog also has been threatened with astronomical fines by individuals who appear to believe they can trademark their names as a means of assuring that reporters cannot use them when covering matters of public record or public discussion. Whoever is carrying out the hectoring campaign against wserra, RealScam.com, Edgington and the PPBlog appears to believe it prudent to encourage HYIPers to purchase firearms, apparently out of concern that the antiscam community may organize a flash mob and appear at the homes of HYIP purveyors. And, the individual further suggests, the White House should be brought into the loop about perceived plots in the antiscam community to harm the HYIP trade. 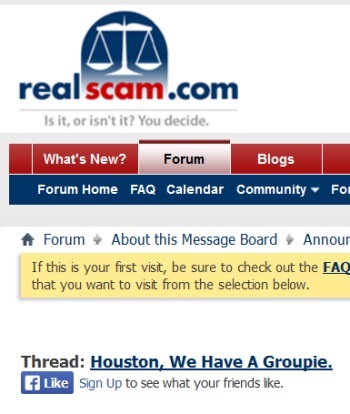 Apparently after determining there was a need for HYIP purveyors to conduct a swift intelligence-gathering operation on critics who post on RealScam, one or more HYIP colleagues “have dissected this [RealScam.com] group in the matter of 2 days,” the individual asserted. The individual offered no guidance on how to deal with RealScam posters who may, for example, have no issues with social rejection, depression or head lice while at once being African American or of another race, trim, in shape, young or youngish and educated. RealScam, according to the individual, also includes “dedicated snitches,” a line that plants the seed such snitches should be dealt with harshly by HYIP purveyors. Part of the individual’s “strategy” — if it can be called that — appears to be to overwhelm authorities with complaints about RealScam and some of its posters. Such an approach may be consistent with the approach of a “sovereign citizen” or a person who has fallen down a “sovereign citizen” rabbit hole. One of the “sovereign” strategies is to overwhelm courts and agencies with paperwork and to make false claims against individuals. Coinciding with the most recent attack on RealScam and some of its posters is an apparent bid to encourage complaints to RipoffReport. These events are taking place against the backdrop of continued efforts by a well-known cyberstalker to use lurid sexual innuendo in attacks against the antiscam community, including the depiction of one antiscam advocate as a diaper-wearing pole dancer. At the risk of sounding stupid, what does Hector mean? Dorothy: t the risk of sounding stupid, what does Hector mean? I would have been glad to go to the dictionary myself but I thought it was a “new” term. I have never heard Hector before. Sounds like nothing to be concerned about, just some nutjobs running loose. The “Militias” are often known to have their own idea about law… and reality. Like Robert Guenther and Larry Friedman!